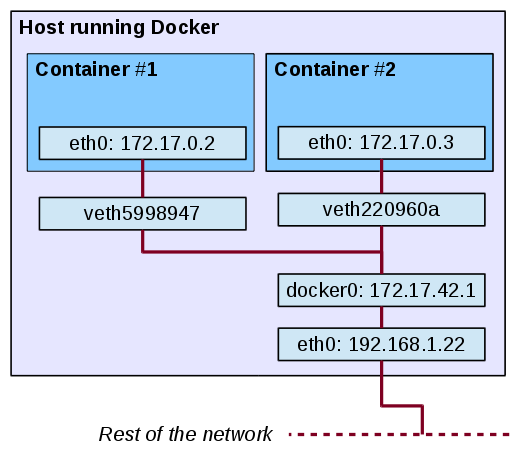 When Docker starts, it creates a virtual interface named docker0 on the host machine. It randomly chooses an address and subnet from the private range defined by RFC 1918 that are not in use on the host machine, and assigns it to docker0. Docker made the choice 172.17.42.1/16 when I started it a few minutes ago, for example — a 16-bit netmask providing 65,534 addresses for the host machine and its containers. The MAC address is generated using the IP address allocated to the container to avoid ARP collisions, using a range from 02:42:ac:11:00:00 to 02:42:ac:11:ff:ff.